For the fourth consecutive year, the Bible App has been ranked in the top 100 Free apps for iPhone on Apple’s “Best of” list. 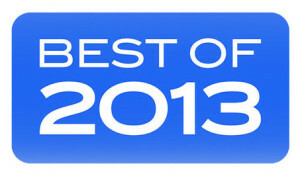 And for the third year in a row, the Bible App was also ranked in the top 100 for iPad. This is just a part of the story that continues to unfold across the worldwide YouVersion community throughout 2013. What we’re seeing right now is nothing short of an amazing work of God. The Bible App reached 100 million installs—just in time to celebrate our 5th anniversary in July. And by the time 2013 ends, we’ll have reached nearly 125 million. People all around the world are engaging with the Bible in new ways, people like Roxann, who told us she was finally able to set aside the Braille Bible that took up 5 feet of shelf space. Now she can hold her Bible in her hand. Because you never stop sharing how the Bible is shaping your life on Facebook, on Twitter, and face to face, many more people all over the world continue to discover the Bible App and experience the powerful love of God.